Colonial Spain provides the answer for clergy anxious not to antagonise their bishop: obedezco pero no cumplo. I would have thought that even if Cardinal Nichols had weak Latin skills, he had advisors who would correct him before he would a foolish official statement. Indeed. 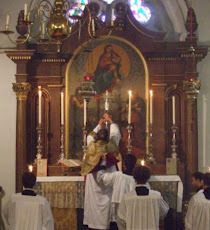 The 1996 revision of Fortescue by Dom Alcuin Reid for the 1962 liturgy has the charts from the missal on censing the altar, and there is a chart for freedtanding altars where one can circambulate the altar. The swings are simply transferred, so the count remains at 22. The drama about this rubric is indeed boring, and rooted, I fear, in the less than perspicuously (let alone elegantly) composed Latin from the contemporary Holy See. Said chart is lifted directly from a diagram in the '62 Missal labelled, "ORDO INCENSATIONIS ALTARIS quod commode circuiri potest" [sic]. What I find remarkable is that Card. Nichols (et hoc genus omne) has apparently failed to notice that §299 appears in GIRM's Chapter 5, "The Arrangement and Ornamentation of Churches for the Celebration of the Eucharist". That is to say, it is explicitly labelled as an architectural directive. While the Latin does invite a degree of ambiguity (though not as much as Card. Nichols seems to think), one might have thought the honest approach to resolving that ambiguity would be to note the context of §299 and read the text accordingly, as relating to the architecture, and not as a wholly misplaced, obiter directive as to the manner of celebration, which would belong in another chapter entirely. I wonder why he chooses not to do that?